The Dolphin Swim Adventure on Grand Cayman is a unique experience designed to take you and your family into the underwater world of dolphins. Hugs, kisses, riding and shaking hands with dolphins will delight children and adults alike. The island of Grand Cayman itself has hundreds more sightseeing and relaxation activities to help make your next family vacation unforgettable! The Cayman Islands are home to some of the most diverse flora and fauna in the world, and the centerpiece of the British overseas holding is undoubtedly Grand Cayman— the biggest island in the group. Grand Cayman is known worldwide for its dazzling beaches and resorts, as well as the scuba diving and snorkeling options it provides. Grand Cayman's nautical mystique is only heightened with the addition of Dolphin Discovery's Dolphin Swim Adventure. Dolphins are one of the world's most beautiful and intelligent marine animals, and the chance to interact with them in the underwater paradise just off of the Cayman Islands is an opportunity any animal lover wouldn’t want to miss. Dolphin Swim Adventure consists of a beautifully planned interactive program that allows you and your family to get up close and in the water with these amazing nautical mammals. The program includes a boogie push, a handshake, a hug, and a kiss with a dolphin that is guaranteed to leave children giggling and adults smiling from ear to ear. The program is capped off by a belly ride, where you will be pulled through the water at rapid speeds by a dolphin swimming on its back. 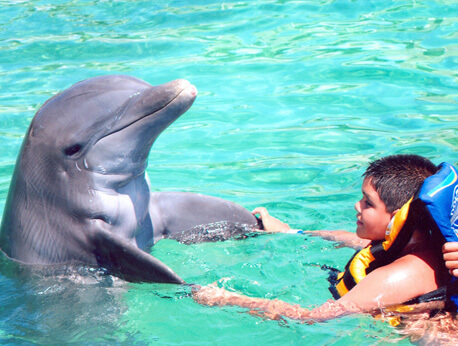 Dolphin Swim Adventure offers a variety of packages to families, the most popular being the 30-minute option. A valid passport is needed to travel to Grand Cayman, as it is an overseas foreign territory. All visitors must wear life jackets and pay a small additional fee for photos of the experience. After your once in a lifetime experience with a dolphin, make sure to take the time to check out the rest of Grand Cayman. Traversing immaculate Seven Mile Beach, visiting the lush botanical gardens, interacting with rays and turtles, and taking lovely pictures of limestone rock formations are just a few of the litany of experiences and adventures this island paradise offers travelers. Dolphin Swim Adventure is an important part of experiencing the full effect of Grand Cayman, and at such a manageable price for such an incredible experience, there really is no reason not to participate. Your visit to Dolphin Discovery on Grand Cayman will be a family vacation that will be impossible to forget.